As mentioned in my last post, we've had a significant number of people use our beta Tax Disc and SORN services over the last few months - nearly 200,000 transactions in total. We've also had a lots of positive feedback and suggestions for how we can improve the service further. As the beta has progressed, we've been tweaking the service and making changes based on this feedback on a regular basis. I wanted to share with you a couple of the improvements we've made since we launched the beta. Around 30% of the traffic to our beta services comes from a mobile phone or a tablet. While we built the service to be responsive from an early stage, based on feedback we've made a change to the form fields so they show an appropriate keyboard on mobile devices. This now means that if you have to enter reference numbers or similar types of information, your mobile device should show the number pad rather than the full keyboard. 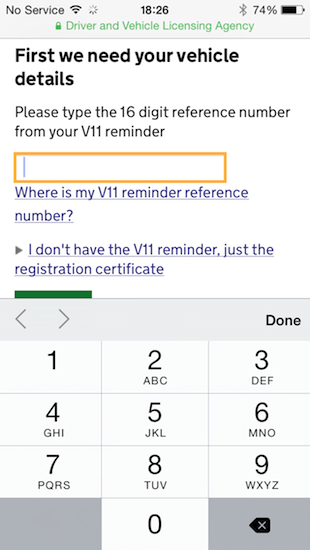 Hopefully this will make it easier to type in the V11 reference number and your payment details. In cases where a card payment has failed for some reason, we were seeing users cancelling the transaction and starting again from the beginning. We've now made the button to re-try the payment more prominent. We hope that this will mean people re-try the payment rather than start again. We've been making other changes and are working on more. We'll post updates when we can.